IN A DESERT REGION, the presence of a dependable source of water is of vital importance to many forms of life, including man. That Indians have lived in the area for the past several thousand years is attested by stone implements, pottery fragments, and the remains of ancient campsites which have been found in the monument and its vicinity. The very early people were nomads, depending upon native plants and animals for food and the occasional springs, seeps, and tinajas for water. It is not known whether these prehistoric people were ancestors of the Papago Indians who were living in this region when the first historical records were made. 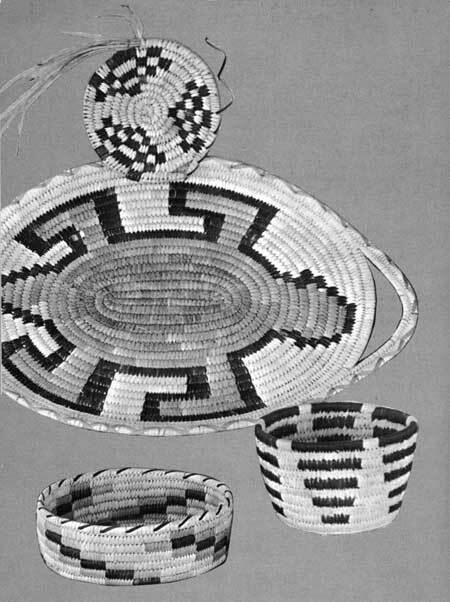 Papago women make beautiful baskets from native plant material. Although the Papagos developed a primitive agriculture, using floodwater irrigation, they subsisted principally by hunting and gathering native plants and seeds. Among their main foods were mesquite beans and cactus fruits. As far as is known, these desert Indians established no permanent villages within what is now Organ Pipe Cactus National Monument. Indications of occasional occupation of caves and the remains of simple shelters suggest that inhabitants of Papago villages east of the Ajo Mountains made annual pilgrimages into the area to harvest fruits of the organpipe and saguaro cactuses. Presumably this activity was continued for generationsbefore, as well as after, the arrival of Europeans. Coronado and his expeditionary force in 1540 did not come within 100 miles of the present monument, but he sent his lieutenant, Melchior Diaz, to make contact with Alarcon who was at that time exploring by ship the Gulf of California and the lower reaches of the Colorado River. Although there is no positive evidence that Diaz set foot on land now within the boundaries of the monument, he must have passed nearby. His name, as that of the first European to see the area, has been memorialized in Diaz Peak, a mountain in the southeastern part of the monument. In 1699, the energetic, mission-building Jesuit, Father Eusebio Kino, established a small mission near Sonoyta, a few miles south of the present monument boundary. Kino pioneered the route passing south of Quitobaquito along the Sonoyta River to Agua Dulce and El Carrizal, then striking boldly across the desert to the Gila River. This route, later called Camino del Diablo (Devil's Highway), was used at intervals for more than two centuries. Francisco Garces and Pedro Font, Franciscan missionaries among the desert Indians, passed this way during the 1770's. Juan Bautista de Anza led a party of colonists from Tubac, about 100 miles east, north of the present monument in 1776 en route to California and the founding of San Francisco. During the period of Spanish occupation from 1539 to 1823, and of Mexican rule from 1823 to 1853, the search for precious metals led prospectors into the region. Discovery of gold in California brought a flood of travel from the East, beginning in 1849, over the various immigrant routes, including the Camino del Diablo. Some of the livestock and a few of the travelers perished as a result of the rigors of the desert and attacks by Indians and Mexican bandits. Following the Gadsden Purchase in 1853, which established the present boundary between the United States and Mexico, prospectors came into the area and opened a number of small mines. Among those within the monument are Copper Hill, Growler, Milton, and Victoria. Although some gold, silver, and copper was found, none of the mines proved profitable, and hence they were worked only sporadically. As far as is known, Quitobaquito Springs is the only continuously used location within the monument. Never the site of a permanent settlement, it served for many years as a major watering place for Sand Papago Indians, who occupied the region around the head of the Gulf of California. In 1830, a group of Sand Papagos who had established themselves alongside Camino del Diablo were driven off by Mexican authorities. Later, squatters at Quitobaquito impounded the spring waters for a small irrigation operation. And between 1888 and 1892 a Mexican Jew, Mikul Levi, built and operated a small store at this location. Cattle were introduced to this region by Father Kino in 1699. After the Gadsden Purchase, grazing activities increased, with small-scale operations by several stockmen. These interests, in the Organ Pipe vicinity, were taken over by Robert Gray and his sons in the 1920's. When the area became a National Monument, the Gray family was issued a special-use permit to continue grazing during the lifetime of the father and his sons, but they were not to expand the herd of 1,050 cattle then in the monument. An Executive order of November 12, 1923, set aside Quitobaquito Springs and an adjacent tract of approximately 40 acres as a public watering place, reserving it from settlement. 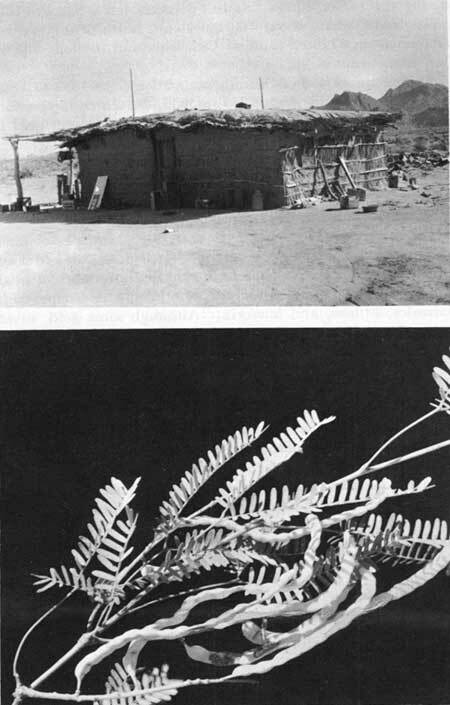 (Above) This typical Papago home is on the reservation immediately east of the monument. (Below) Mesquite fruits provide food for wildlife and at one time were a staple item in the diet of Papago Indians and pioneers. Following a reconnaissance in 1932, the Tucson Natural History Association began pressing for the preservation of an outstanding area of typical Sonoran Desert which would include stands of organpipe cactus. In 1934 the Pima County Board of Supervisors and the Ajo Chamber of Commerce went on record favoring the proposal, and in 1935 the National Park Service sent a group of officials into the desert south of the town of Ajo to carry out a detailed survey. This group recommended, for National Monument status, approximately the area included within the present boundaries. This recommendation was approved by the Secretary of the Interior on December 28, 1935, and the Presidential proclamation creating Organ Pipe Cactus National Monument was signed on April 13, 1937. Funds for the protection and development of the monument were made available in 1939, and the first custodian, William R. Supernaugh, was appointed in October of that year. He established his residence and office in Ajo. With a dependable supply of potable water as the prime consideration, a geological reconnaissance was made, a headquarters site was selected, and a well was drilled. In September 1944, the custodian moved onto the monument. Publicity connected with the establishment and opening of the monument stimulated a phenomenal rise in the tempo of travel to the area (9,963 visitors in 1940 and 329,800 in 1963), making necessary the establishment of an adequate campground and the development of an access road system to enable visitors to reach and enjoy the areas of principal interest. Under the National Park Service's Mission 66 program, plans for the monument headquarters development were pushed, and in 1958 a visitor center building was completed and opened for public use.